How do you measure the pleasure of coffee? Stay authentic. Follow your style, your location and what your customers want. Show that you have taste and offer your own special variety of coffees to enjoy. Melitta Professional will assist you in the process with tailored solutions. 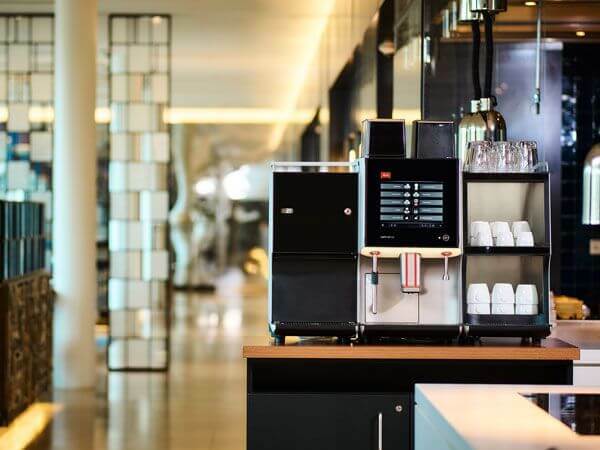 Hotel, restaurant, bar, bistro, café, coffee bar, coffee shop, pub… - full service or self-service, refined or fast, cool or casual: we advise you on site and find the coffee concept that suits your establishment. Totally authentic, a strong partner on equal terms. Open your eyes: set the scene for what you offer! Coffee prepared to taste, freshly ground, for top-quality results in every cup. Delicious milk foam variants – cold, warm or hot, liquid, frothy or firm. Two types of fresh milk. Two varieties of cocoa powder. And, in parallel, up to 40 litres of hot water/hour for tea lovers. Our modular Melitta® Cafina® XT generation ticks all the boxes and is a real eyecatcher: these slim machines with an elegant design draw attention to themselves. The light concept and multimedia touchscreen set an appetising scene for your beverages. Convince yourself! What would you like? Filter coffee or cappuccino? Find the right coffee machine to suit your needs here.